When parents hear in their child’s voice that their son or daughter may be feeling homesick, moms and dads know that sending comfort food, or food that reminds them of mom’s home-cooking, is a quick way to cheer them up and make them feel better. Unfortunately, rushing over to the dorms with a crock-pot full of homemade soup isn’t always possible for most parents. However, there’s one new company solving this problem in a unique way. Like many college students, while Mitra Raman was living away from home for the first time, she realized just how much she missed her mother’s incredible home cooking, specifically she was craving a bowl of her mom’s Rasam (a traditional South Indian dish). Once when she was visiting home, her mother showed her that if she had the right ingredients ready, she could just add hot water to complete the dishes quickly, and enjoy a delicious, healthy meal reminiscent of her childhood favorites. That was the moment Mitra realized that anyone could have their favorite childhood meals without spending too much money or time. This led her to launch The Buttermilk Company, which provides fresh + authentic Indian meals that are available to be shipped all over the country. They make everything from scratch in their Seattle kitchen using only locally sourced ingredients + fresh vegetables. No preservatives. They cook, package, and heat-seal every packet, made-to-order. Your order ships to your son or daughter in minimal + recyclable packaging to keep cool in transit. Your student can make a fresh + delicious meal in 5 minutes by microwaving or boiling with water. The meals are less expensive + healthier than anything your kids may order in, and just as quick to make as Ramen Noodles. The meals may be stored in the fridge for 5-7 days, or in the freezer for up to 3 months. They’re ready when your student needs them! In addition to the individual meals, The Buttermilk Company also offers a variety of combination packs so that you can pick out what your son or daughter might like best. The “I Can’t Do Spicy Food” Pack includes 1 upma, 1 khichdi, 1 coconut chutney, 1 daal, plus 1 grain of your choice! The next time you want to cure your child’s homesickness, order The Buttermilk Company’s care package! 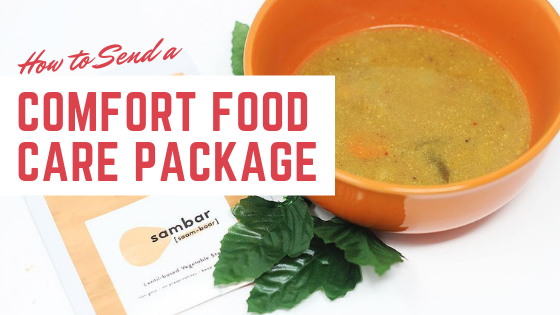 For just $35 plus shipping, this unique care package includes 6 meal packets of your choice, plus a fun gift specifically chosen to improve your student’s life from the Buttermilk team! They also offer a subscription option so that you can save and make sure your student will always have something healthy and tasty to eat while away from home.